Taj Mahal is the most beautiful when we look at its view from the fort. The Giant that Agra Fort is enough to throb our heart, the experience of Shah Jahan's pain when he would have the view of his beautiful building, Taj, from the fort where he was imprisoned by his son Aurangzeb. 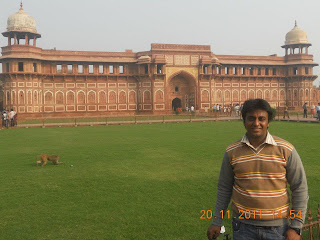 Agra Fort, is a monument, (Hindi: आगरा का किला, Urdu: آگرہ قلعہ‎) a UNESCO World Heritage site located in Agra, Uttar Pradesh, India. It is about 2.5 km northwest of its more famous sister monument, the Taj Mahal. The fort can be more accurately described as a walled city. After the First Battle of Panipat, in 1526 Mughals captured the fort and a vast treasure - which included a diamond later known as the Koh-i-Noor diamond - was seized. Babur stayed in the fort in the palace of Ibrahim and built a baoli (step well) in it. The emperorHumayun was crowned here in 1530. He was defeated in Bilgram in 1540. 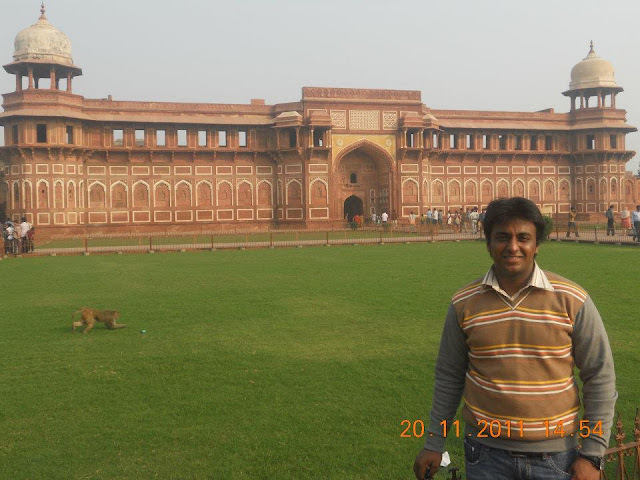 Sher Shah and his descendants held the fort for fifteen years. In 1555, Humanyun recaptured it for some time when the Hindu king Hem Chandra Vikramaditya defeated his army and captured the fort. Akbar defeated the Hindu King Hemu chanda finally at the Second Battle of Panipat in 1556. From Wikipedia, the free encyclopedia.